Formed November 1978 by Gaynor, Hannigan and Winter following the breakup of the East Coast Angels. 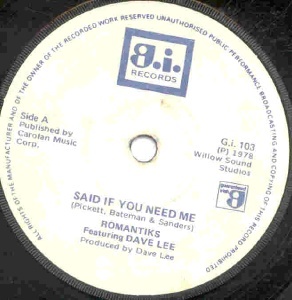 Singer Dave Lee gets top billing on the label of their double A-side single which is mentioned as imminent in In Dublin magazine in February 1979. Both tracks are covers. The band played the Dandelion Market on Saturday 26th May 1979 (mistakenly billed as The Roumantics in some sources) supported by The Strougers (misprinted The Strangers in some sources). 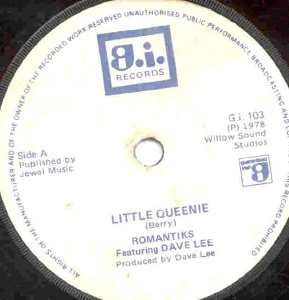 They also played a Sunday afternoon residency at the Red Line in May/June 1979, billed as Dave Lee & The Romantiks. After the split, Henry Winter concentrated on songwriting; Ben Hannigan became an actor; Jimmy Gaynor formed The Takeaways and then The Shy with another ex East Coast Angel Dave Flanagan; he also later fronted his own Jimmy Gaynor Band.